Systematic Investment Plans (SIPs) of mutual funds are so aggressively promoted and popularised that many tend to believe that mutual fund SIP is an investment product by itself. However, a SIP is only a facility offered by Asset Management Companies (AMCs) to investors. Through a SIP, an investor can invest in a mutual fund on a monthly or quarterly basis. Daily SIPs or Weekly SIPs are also available in some schemes. The monthly SIP option is the most popular of the three. All you need to do is select a scheme, define a regular investment amount, pick a date for the monthly deductions, and set the tenure. This can range from 6 months to perpetuity. Once setup, the AMC will automatically deduct the monthly payment from your bank account and invest it in the scheme. This is a hassle-free way to invest in mutual funds and develop a regular savings habit. But more importantly, the SIP of mutual funds handles market volatility. Equity markets, despite the volatility, have the potential to create long-term wealth. So as an asset, you cannot ignore equity mutual funds. To deal with the short-term volatility, you need to invest wisely. This is how mutual fund SIPs help to average out the cost of your investment. When the market goes up, you buy lower mutual fund units. If the market dips, you can pick up a higher number of units. Thus, you are able to lower the downside risk by averaging out your cost. Let’s assume you invest Rs 1,000 every month for the next 12 months in a mutual fund with a starting NAV of Rs 100. Over the course of the year, the NAV of the scheme dips by 10% to Rs 90, soon turns bullish and ends up at Rs 110 at the end of the 12 months. A simple calculation reveals that the NAV of the fund has grown by 10% in one year. How much has the investment through the SIP grown? Over the 12-month period, you invested Rs 12,000 and in-turn picked up 121.10 units. At the end of the year, these units are worth Rs 13,321 (NAV Rs 110*121.10 units). The gains work out to 11% ([13321-12000]/12000). As the market headed lower, you were able to average out your initial investment cost. In this example, the average NAV cost works out to Rs 99.33. Thus, even though the market has dipped by a significant amount, it averaged out your costs and gained returns as soon as the market moved up. Now that you have understood how Mutual Fund SIPs work, we now compare SIPs to lumpsum investments in order to pick the better of the two. Investing a large sum of money at one go is always a high-risk proposition. What if the market heads lower? So will your investment. Hence, a better strategy often propagated is, to break up your lumpsum investment and buy mutual fund units over the next few months or years. However, this strategy may not always work in every market condition. SIPs may not often deliver returns better than a lumpsum or one-time investment. While there is always a risk of investing a large sum of money, it has more to do with your investment horizon. You simply cannot invest in SIP for a 1-year or 3-year period and expect returns better than a lumpsum investment. The primary aim of a SIP is to lower the average cost for a given investment. Therefore, for a SIP to trump a lumpsum investment, the NAV of the subsequent investments needs to be lower than the NAV at the time of the first investment. By doing this, you will be able to accumulate more units. And when the NAV moves back up, you can realise the higher value of the additional units you have accumulated. A monthly SIP works best if the market undergoes a correction during the SIP investment phase. If it does, you will be able to lower the average cost. Had you made a lumpsum investment, there would be no way to average out your costs if the market corrected. Hence, in this condition, SIPs outperform Lumpsum investments hands down. Have a look at the three-year market periods in which it was an ideal time to invest via a SIP. We assume an investment of Rs 5,000 every month. The NAV is based on the movement of the S&P BSE Sensex. As seen above, when the market dipped, there was ample of opportunity to lower your cost. 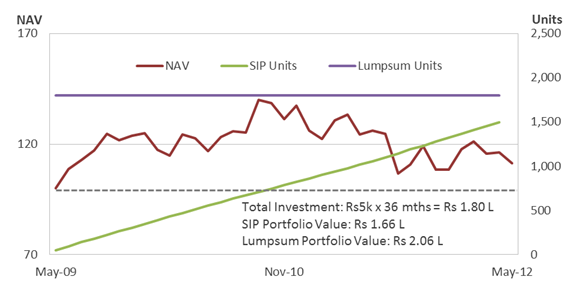 Thus, at the end of the period, the SIP portfolio delivered decent return, while the lumpsum portfolio failed to deliver any gains as the NAV closed just below the purchase price. Similarly, in an earlier period, in which the market was broadly volatile before moving back up, there were many occasions to lower your purchase on the NAV cost. 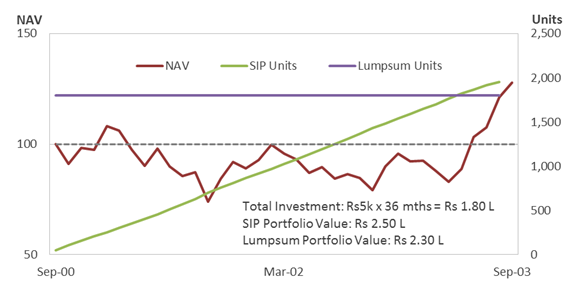 Here, though the lumpsum investment generated gains due to a higher final NAV, the SIP performed better as you were able to average out your costs. Here, it is important to note that by investing a sum of money via a SIP, you would additionally earn an interest on the investment kept in your savings account that’s linked to your SIP. This interest would work out to extra income of Rs 10 – Rs 15,000. Another alternative to SIP is a Systematic Transfer Plan (STP), but we’ll save that for a another discussion. This is quite simple to understand. When the market moves in exactly the opposite way as the periods considered above, that is when SIPs will fail to outperform a lumpsum investment. This is because you will be purchasing units at a higher price, making your average purchase cost higher than the initial NAV of the first instalment or the lumpsum investment. 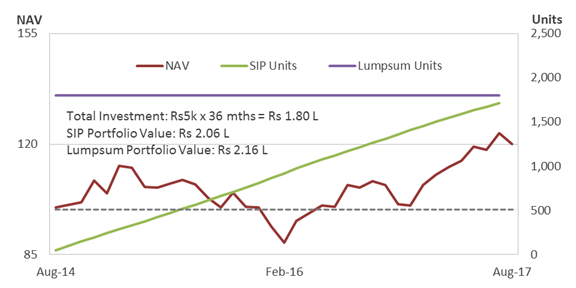 As seen above, as the market moves higher, the subsequent investments of the SIP were made at a higher NAV, increasing the purchase cost. So, even though the NAV ended at a higher value compared to when it started, the SIP returns were negative. In other words, it led to a capital loss. As the market ended higher, the lumpsum investment generated a higher gain. While this may initially seem like a good time for SIPs compared to a lumpsum investment, it was not. As seen in the chart, a small window of opportunity existed to lower your purchase cost when the market tanked in February 2016. On the rest of the occasions, the SIP investments came in at a higher price. 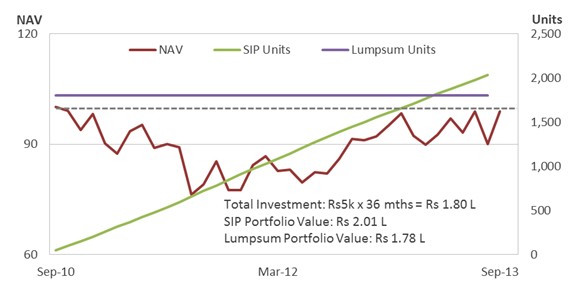 As the data shows, the lumpsum investment did marginally better than SIP. Thus, even if you pick the best mutual fund for a SIP, it may not work in your favour if the market continues to tread higher after your initial investment. SIP or Lumpsum - Which route should you choose? If you take a finer look at the above illustrations, SIPs did well when it was started at market peaks. Because, when the market corrected, it gave investors an opportunity to lower their costs. If you started a SIP at a market bottom phase, your subsequent investments would have come at a higher cost. Hence, a lumpsum investment would have done better. However, here’s the caveat — if you could identify market bottom or market peaks, you would now be sitting on tons of extra income. Remember, the above examples have been cherry-picked to show the market phases that SIPs worked in and when it did not. No one can say for sure where markets are headed. One could employ market-timing strategies, but they may not always work. The Sensex has hit a peak of 33,000. Could one say for sure it would touch this level when it was at 30,000? It could only be a lucky guess. Those who started a SIP instead of a lumpsum at 30,000 thinking markets would correct would now be investing at a higher NAV. But, what if the markets had corrected like in February 2016? Hence, there is always a risk. In times of euphoria, a SIP would undoubtedly be a prudent route as compared to investing your corpus as a lumpsum. If the markets do not turn out in your favour and your SIP delivers disappointing returns, do not get dismayed. When investing in equity, it is important to keep a long-term investment horizon of five to seven years or more, even if you are investing via a SIP. The returns may be a few percentage points lower as compared to a lumpsum investment, but it will still be sufficient to meet your financial goals. Clearly, SIP-ping into mutual funds with all these benefits and much more, will help achieve your financial goals. As mentioned at the beginning of the article, SIP is only a method of investing in mutual funds. To support this investment method, you also need to pick the right mutual funds. PersonalFN offers a report titled "The Super Investment Portfolio – For SIP Investors." Try our SIP Calculator to find future value of your SIP contributions.